Velma Leighton, daughter of Alba Jacob Leighton and Estella Blanche Osborne, was born June 26, 1914 near Gravity, Taylor Co., Iowa and died Oct. 13, 2007 in Port Richey, Pasco Co., Florida. 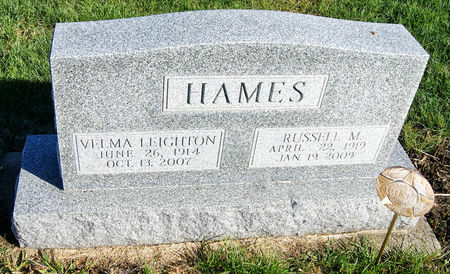 She married Russell M. Hames Nov. 20, 1943 at Denver, Denver Co., Colorado. He was born April 22, 1919 in Yell Co., Arkansas, son of Harry Simpson Hames and Lillie Barger, and died Jan. 19, 2009 in Hudson, Pasco Co., Florida. Searching for VELMA FERN LEIGHTON HAMES in Taylor County Iowa?